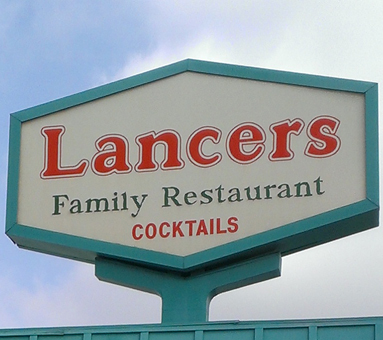 (1969) Lancers Restaurant, Burbank | Remains of L.A. I woke up early on Saturday and walked to Lancers to have breakfast before work. I’ve driven past Lancers many times, and while the turquoise roof and sign are kind of neat, the way they keep the shades mostly down on the windows always made it seem very plain and possibly not open. So I was surprised to find it crowded. It was much bigger inside than I’d expected, but not very interesting. This place might be the prototype on which all Denny’s are based. -Booths are turquoise and peach, walls are either light formica or beige wallpaper with light turquoise and peach stripes that somehow make it seem more beige, stucco drop ceiling with skylight insets that I’m pretty sure aren’t real skylights, just white plastic tiles with some curlicues on them. -In the entryway are the following things: A pie display case, a Lotto machine, a catch-a-toy-with-a-claw game, an ATM, a low side table holding a hotel-room-style lamp and a gumball machine. There’s a lot going on in this entryway. -I ordered a steak sandwich, which had garlic toast as the bread, with fruit on the side. The waitress told me it came with soup or salad but that they didn’t have any soup just then, so I had to have salad. I guess cause it was so early? I knew I wasn’t likely to enjoy what they considered a small green salad, so told her that the fruit was all the side I needed. -Over the serving counter is a large sign that reads “If you’re not proud of it, don’t serve it.” My first thought was that it was intended as instruction for the waitstaff, but that doesn’t seem very fair. They’re not the ones who cooked it and put it on the plate, after all, so the whole idea of them being proud of it doesn’t really work, and I’d hate to think of them having to tell the cooks, “sorry, this is perfectly adequate I’m sure but I’m really not quite PROUD of it, so could you try again?” I decided instead that this is sort of the Lancers motto, or something, and they put the sign there so the customers would know that they’re proud of what they serve. I guess. -When I went to the restroom I found that the room towards the back of the restaurant is much fancier, with lots of round turquoise booths all set catty-wumpus to one another, and pictures on the walls. Not the most interesting pictures, maybe, but pictures. -The waitress refilled my cup of decaf when it was only half gone. I know that’s meant to be very conscientious and all, but I hate it. I can never get the cream and sweetener right when they do that. -Two little girls–around five–came in with a dad (I assume of only one of them since they were about the same age and didn’t seem to be twins). One girl was wearing a yellow dress with pictures of cats wearing sunglasses and white sandals, with one white sock and one sock that was dark blue with multi-colored polkadots. The other girl was wearing a quiet gray dress, with a hot pink glittery Minnie Mouse ears headband. -There was an antique-looking square clock encased in glass on the wall near me, and I could see that there was writing etched in the glass. I finally got up to read it, and it said, “Improve your time and your time will improve you.” I’ve tried and tried to force that to make any kind of sense at all, but no. What I Read While I Ate: Finished The Two Princesses of Bamarre by Gail Carson Levine;. Middle-grade fantasy, and utterly delicious. Just adored it, wish I could pop an amnesia pill and read it again at once. What Sort of Ghost I’d Expect to Find if I Believed in Ghosts Which I do Not: Three little old ladies who came here for lunch after church every Sunday for twenty years. Categories: Uncategorized | Tags: 1969, burbank, Family restaurant, Restaurants, retro, vintage | Permalink.